The Cold Spring trailhead is on Mountian Drive behind Montecito. Head up Hot Springs and turn left on Mountain to get there. 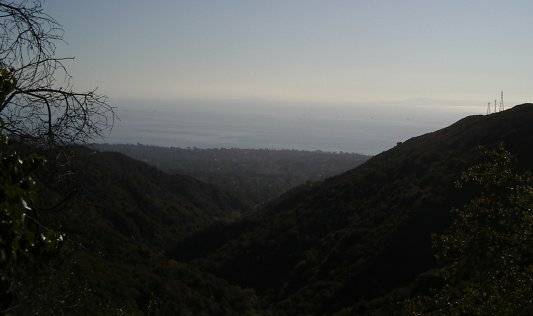 For more extensive and somewhat silly directions, see localhikes.com, which has plenty of other useful information too. For another viewpoint, see here. So, get there, head up the trail on the east side of the stream, and when you get to the fork in the trail, take it! Hahaha. Okay, standard joke out of the way. So, get there, head up the trail on the east side of the stream and go left at the fork to cross the stream and join the trail runners. Some people are just mad about running. Not too long after there's another fork, this time go right and leave the main trail. Very shortly up that there is a third fork, one leading up the narrow canyon and one climbing the hillside. Presumably the falls is up the one on the narrow canyon, but if you've read the second site up there, you might think that's the old trail and the one up the hillside is the new trail rather than a different trail altogether. We (me and mom) turned up the hillside, so can't say how far the trail along a steep side of a narrow canyon actually went or if the falls were accessible. Climbing up above the city always gives a good view. The islands are hard to see, but the sharp eyed can pick out Santa Cruz and Anacapa.